I’m really excited about Microsoft’s switch today to make standards mode rendering the default rendering style, going forward – even at the cost of “breaking the web.” I think this is going to have serious positive ramifications for the whole web ecosystem, which is just fantastic. I can’t imagine this decision coming lightly and I greatly respect them for making it, even turning about after plenty of criticism. â€œWhile we do not believe there are currently any legal requirements that would dictate which rendering mode must be chosen as the default for a given browser, this step clearly removes this question as a potential legal and regulatory issue,â€ said Brad Smith, Microsoft senior vice president and general counsel. The straw that broke the camel’s back? Even if that’s not the case, whatever the final reasoning was, I’m just glad that this conclusion has been come to. The web will soon be a much better place for everyone. I’m not entirely sure you have the ratio of blue and purple quite right there, but still, very nice. I’m curious, though– doesn’t this still mean trouble for library authors and IE-competing browser makers? I mean, the targeting will still be there, and anyone will be able to use it to force IE7 mode on a page. I see you caught that, too, John. Ha, that’s just what I thought when I saw that. Neatly and quietly tucked down there, third paragraph from the end. Casually mentioned. Ahh, MS, they could have simply left it out… but… guess not. So John, I’ll bet you’ve been asked and answered before, but what do you use to create your charts? Eddie: I think that looks like Keynote. @Eric Meyer: I don’t think it affects library creators at all, considering that we’ll still have to support multiple versions of Internet Explorer (6/7/8) for quite some time. Eventually once the true versions of IE 6/7 have disappeared we can simply say “we only support IE 8/9/10” since that’s a decision left up to the page developer, now, not the browser user. The fact that the browser targeting is still there is not a bad thing for browser vendors: It’s only an incentive to those who wish to keep their pages behaving identically, in Internet Explorer, into the future. And really that’s only enticing to one group of people: Intranet application developers whose applications only work in Internet Explorer. It isn’t useful, and thus isn’t a concern, to normal web application developers because no one would add that to their site with the expectation that it would “keep their site working the same, forever” – when it obviously wouldn’t (unless, of course, they were only targeting IE in their web app, for some reason). I’m pretty content with the situation. There’s probably some room for abuse here but overall I think the solution that IE is proposing to prevent “breaking the web” is perfectly acceptable for all parties involved. @Eddie Welker: Manuzhai is correct, created in Keynote! It definitely makes the sexiest charts. I’ve gotta build a chart-making program that builds these so that I don’t have a ton of 1 page presentations on my hard drive. I wish i could share your enthusiasm. What i see instead is a well thought out plan to position MSOffice as the editor-interface into MS cloud computing systems, with IE as a universal web viewer. As most know, Microsoft has been busy pulling out all the stops to get ISO approval of the MSOffice specific OOXML. That ISO would ever get this far towards considering OOXML as an interchange format shows just how far out in the weeds the venerable standards org has gotten. But here we are. IMHO, the key to Microsoft’s OOXML strategy can be seen in the recently released MSOffice SDK. The SDK provides a component for the fluid conversion of OOXML to something called fixed/flow. The fixed part of this interesting conjunction is also known as XPS, which is designed as a proprietary alternative to PDF. The flow part is a fascinating and highly proprietary replacement for (X)HTML – CSS. Reading further through the MSOffice SDK, one can’t help but be amazed at the lack of W3C technologies; especially (X)HTML, CSS, XForms and SVG. What we have instead is an entangling cascade of stuff like OOXML, fixed/flow, silverlight, XAML, and WPF. And then there is that recent promise of other high volume API’s probably delivered through future Exchange, SharePoint, and MS SQL Server SDK’s. So, at the end of the day, what are we looking at here? IMHO, Microsoft has figured out that the smart thing to do is leverage and extend their existing desktop monopoly into the next generation of cloud computing where the Internet platform rules. To pull this off, they have a number of problems to overcome; not the least of which is that they need to catch a break on anti trust, and, get OOXML through ISO. And oh yeah, there’s that little problem that Windows can’t do cloud computing. Fun as those issues are, and Microsoft does have a plan for each of those challenges, let’s for the moment focus on IE, the ACID 2 test, and the OOXML fixed/flow conversion component. Because of their MSOffice monopoly, especially powerful when it comes to business documents and day to day workflows, Microsoft can pull this off without “embrace and eXtend” tactics. All they need to do is protect the transition of MSOffice as the center of gravity moves to a stack of Exchange, SharePoint and MS SQL Server. Instead of embrace and eXtend, a monopolist is able to leverage their monopoly into new markets using wholesale embrace and replace of existing web formats and protocols. It makes sense that IE be brought into full compliance with existing W3C standards because the real advantage to Microsoft is that of eXtending IE the application (not the W3C standards) to also cover the cloud core of MSOffice-Outlook Exchange/SharePoint – MS SQL Server proprietary formats and protocols. Think of it as Microsoft using their MSOffice monopoly to eXtend the Web in ways that can’t be touched by Firefox, Apache Tomcat, or the browser bound Google cloud. If ISO does the unthinkable, and approves OOXML, IE compliance with W3C standards will set the stage for an embrace and replace movement beyond legal challenge. Love your blog John. Best to brace yourself though. Hah. I read the press release and noticed that final little sentence too… and I had the same reaction. I think they’re doing this to try to build some good will in their battle w/ the EU. Either way, I’m happy they’re doing it! Oh, what a beautiful chart! Let’s all drink some milk and take a nap after recess. Seriously, before enforcing standards shouldn’t ms actually have some? >>I wish i could share your enthusiasm. What i see instead is a well thought out plan to position MSOffice as the editor-interface into MS cloud computing systems, with IE as a universal web viewer. You expect an IE for Mac and Linux then? Just imagine if IE lost it’s audience to Firefox (or other browser) in the next few years? Besides the many complaints from web designers/web developers for the lack of standards, I believe it’s a smart move for Microsoft. What is IE8 exactly? And who is this microsoft I keep hearing about? I think it’s quite evident where Microsoft is planning to go with OOXML and the rest, but I’m not entirely sure I follow your reasoning for them bringing IE into W3C compliance. 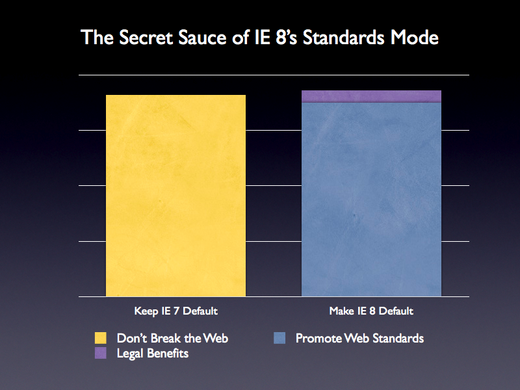 I don’t see the link between their Office plan of attack and IE8’s standards compliance. Another way of thinking through this is to see two types of web ready documents; W3C and MS Cloud. The MS Cloud documents are different. They follow a transition line based on XML encoded MSOffice binary documents (OOXML) to fixed/flow, with silverlight, XAML, WinForms and a growing entanglement of MS specific dependencies, formats and protocols. With a 93% desktop productivity monopoly, (and perhaps upwards of 96% business desktop document workflow), this is a substantial set of documents being brought into the emerging web centric collaborative cloud computing model. It looks as though IE 8.0 will be able read both W3C and MS Cloud documents, making it a universal browser of considerable importance. Do you think Firefox will will be able to similarly transition between the billions of W3C documents and the billions of MS Cloud docuemnts? Do you think the MS Stack that sits at the center of the MS Cloud will foster the development-conversion-translation of W3C documents? The MS Stack being comprised of MSOffice-Outlook Exchange/SharePoint/MS SQL Server? Microsoft’s first response to both Java and Netscape was that of embrace and eXtend. This slowed down the momentum of technologies Microsoft didn’t contol. The next step for Microsoft however was that of embrace and replace. They used the time purchased through eXtend inspired confusion to develop replacement technologies like .NET and the OOXML fixed/flow/Silverlight component. As high volume replacement dependent applications made their way into the marketplace, the eXtend and break period comes to an end, and we have a new duality impossible to deal with. This new duality features cornerstone compliance with accepted standards on the one hand, and wide development against feature rich but proprietary replacement standards on the other. In this situation, the power of the monopolist can be brought to bear, and MS can leverage their way into an emerging market without competition. The interesting thing is that Microsoft had to protect their monopoly during the transition period with a delicate, difficult, and legally dangerous dance of embrace and eXtend. Only a monopolist with the reach of Microsoft could pull this off. Protecting interoperable access to MSOffice-Outlook from server side competitors cleared the way for the Exchange/SharePoint/MS-SQL Server juggernaut. It’s an incredible advantage in the hands of a ruthless monopolist, and it looks like they pulled it off. The Exchange-Outlook and SharePoint-MSOffice interop protocols have been cracked and reverse engineered, but i doubt that anyone will ever break the MSOffice OOXML MS-SQL Server connector. Besides, as the proprietary formats, protocols, methods and dependencies make their way into the work of developers writing against the high volume API’s, the barriers to interop that competition increasingly must crack becomes insurrmountable. IMHO, IE compliance with W3C standards signals that Microsoft is ready for the final push. There are four primary pieces they have yet to corral that could wreck havoc with the grand MS cloud plan. The first problem is that anti-trust issues continue to haunt Redmond. Leveraging an existing monopoly into emerging markets strikes at the core of Sherman Anti Trust Laws, and that is exactly what Microsoft is trying to pull off here. The second problem is that Windows can’t do cloud computing. To overcome this embarrassment, Microsoft must rely on the 2004 deal with Sun, and, a bold but hostile plan to acquire Yahoo! Expect to see Sun x86 Solaris machines running Viridian based Exchange/SharePoint/MS-SQL Server in the new data centers. The Yahoo! acquisition gives MS cover, and, provides a rather unique consumer/business cloud potential. A third challenge is getting ISO to approve OOXML as an international standard. Maneuvering MSOffice into position as a standards compliant MS cloud editor-interface is far more difficult than bringing IE into compliance with W3C standards. To pull this off, Microsoft has to upend the whole idea of standards interoperability and international law. They are very close to pulling this off though. A fourth challenge is boxing out Linux – FOSS GPL competition. The primary weapon for doing this is that of controlling interop with the MS Stack, and separating Linux from the Linux-FOSS application layer. Once again, the 2004 interop-patent deal with Sun is the key. In the aftermath of that deal, Sun dropped Linux, embraced x86, created OpenSolaris, hired Ian Murdock to port the Linux application layer to Solaris/OpenSolaris, acquired MSSQL near immediately after seeing the dependencies declared by the Google cloud extensions, and, surprisingly supported Microsoft in their efforts to get ISO approval for OOXML (see Bosak and Durusau calls for ISO approval of OOXML). Imagine Linux-FOSS applications on OpenSolaris having interop access privileges into the MS cloud that are denied those same applications running on Linux and you get some sense of the deviousness at work here. At the end of the day my concern is that the Internet remain a platform of universal access, exchange and collaborative computing that is used by all and owned by none. It would be a shame to see it cut into the duality of a caste based platform of low end but universal W3C standards access, and high end but MS cloud exclusive information systems. 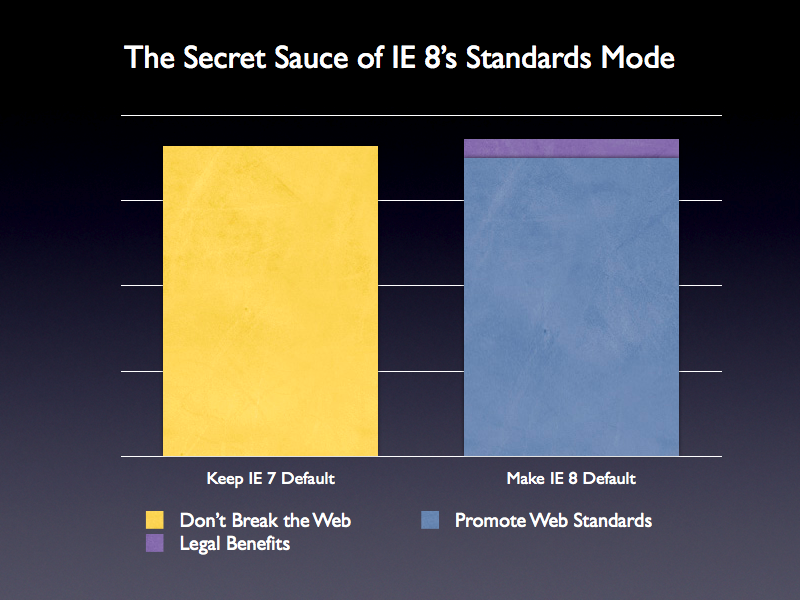 Don’t fall for the IE 8.0 – W3C fig leaf. Insist that all MS applications and services fully comply with W3C standards. And stop the nonsense at ISO. This is interesting. IE 8.0 does not support the XHTML mime type, but will support HTML 5.0 + CSS 2.1. Maybe Microsoft has figured out that it is possible to fully convert their MSOffice documents to XHTML-CSS? One has to wonder why they drew the interop line at XHTML? Giving credit where credit is due, IE 8 is a very nice improvement on IE 7… at least on paper. It fails on my website (go on, you can count the bugs).